Do you think that having a good infrastructure at your food outlet is enough to attract the customers towards your restaurant? If yes, you might be wrong. There are many other things customers expect from you. And while you plan to satisfy your customer needs, there are chances that you might end up in investing a huge capital over it. No doubt an attractive infra and quick services is a must to capture customers, but having an effective menu is one of the most prominent parameters to gain customers' attention. Why focus on the restaurant menu? Your menu decides whether the customer will turn out to be a loyal one or just a one-time customer at your food outlet. It is the first thing that catches the customer's attention and thereby, it becomes necessary that you should have an appealing menu for your restaurant. You need to emphasize on the way your menu is planned, designed, and represented to the customers. Not only this, you must be aware of some clever menu tricks which can let you attract customers and even gain good profits. 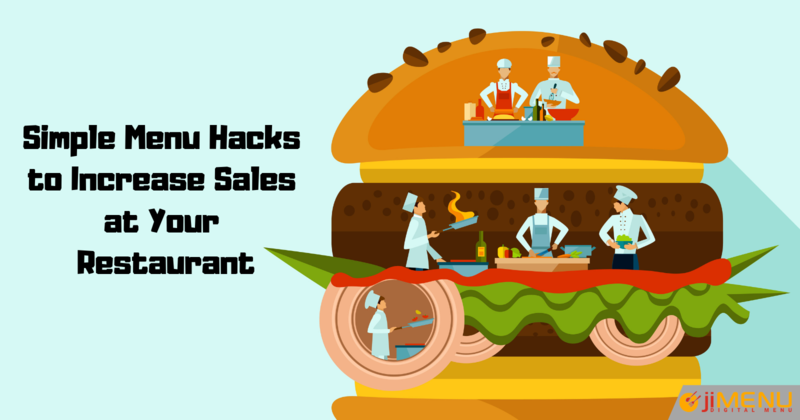 So, here we have prepared a list of top menu hacks which will definitely benefit your restaurant and attain better sales. Analyze your menu profitability: Maintaining a track on profits and sales is a must to keep your restaurant moving. You need to analyze the food items properly and sort those that are more preferred and liked by the customers and ensure that those food items are high-profit items. It's necessary to maintain a proper balance between the customer preferences and the profit you set. Focus on customer feedback: You must get regular customer feedback and get an idea about what customers like more and in which food items do they show dis-interest, or maybe the services which they don't like. So, take customers feedback either by manual methods or by using POS systems where they can write down their reviews. Keep yourself updated: No doubt you have an impressive menu, but you need to stay up to date and change your menu with time and latest trends. Changing the menu items or pricing list is not enough. You need to focus on the menu design, layouts, appearance, and other parameters too. And if you are still struggling with a paper menu, it's really high time to switch to a digital menu. Implement menu labeling: As people are becoming more health-conscious, they expect every detail of the food they are eating at your restaurant. Many restaurants have implemented menu labeling which includes the complete ingredient details of a food item. This will help you in gaining the trust of your customers. Re-analyze your menu design: It might be possible that you haven't reviewed your menu design for the last 2 years. Don't forget that the customers expect something new every time they visit your food outlet. So, you need to check out the latest menu designs practiced in the food industry and stay up to date. Don't ignore your competitors: You must consider your competitors at every stage of your food business. This will assist you in setting competitive prices because if you charge overpriced charges as compared to other competitors, customers won't prefer your food; and if you are charging very low, then be ready to face financial losses. Implementing the top menu hacks at the earliest can be the best decision for your restaurant. It's time to enhance your customer's experience and enjoy greater profits than ever before. Have any queries and want to know more menu hacks? Get in touch with us and get assistance from our experts.